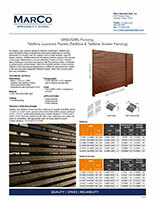 Orsogril presents TaliAlive® and TaliAlive® Screen fencing products. An elegant, pure, rigorous design for timeless architecture. TaliAlive has been developed using a material that reinterprets traditional iron-working artisanship in a modern way. An original choice of high aesthetic value for design solutions. 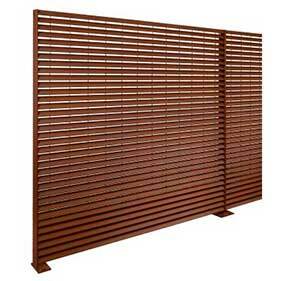 TaliAlive® preserves the privacy features typical of the fencing in this range. Maintenance costs are eliminated, thanks to a “live” material that, by taking on new hues and nuances with the passing of time, contributes to enhancing the overall design. Life and Environment: Unique fencing system encompassing all the appeal of COR-TEN steel. Thanks to the ageing and oxidizing processes, the steel characterizing this system is a “live” material, in that its hues and nuances may change over time, thereby enhancing the architectural design with a play of light and shadow created by the cladding lamellas. An elegant, pure, rigorous design for timeless architecture. TaliAlive® has been developed using a material that reinterprets traditional iron-working artisanship in a modern way. An original choice of high aesthetic value for design solutions. Modern and Efficient: With its low content of alloying elements and high mechanical strength, COR-TEN steel has become increasingly popular in modern architecture that favors not only aesthetic but also maintenance-free and long life products. TaliAlive® encompasses all the features sought after by the most advanced building technology. TaliAlive® guarantees no maintenance costs, corrosion resistance five to eight times higher than carbon steel and high mechanical strength. 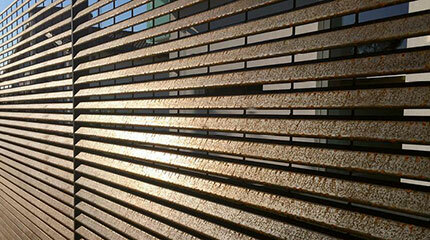 Solutions for Your Project: From the development of new architectural solutions, TaliAlive® is an innovative welded “louvered” grating from the Talia® family, designed for numerous applications: visual and environmental protection, shielding, façade cladding, curtain walling and complete fencing. The Talia® modular system, which is obtained by welding shaped profiles and transversal wires together, features numerous strengths, namely versatility, attractive design, ease of use and installation. The longer special louvered profile in the Talia® Screen version increases the shielding characteristics and provides better protection against the wind and rain. We invite you to contact Marco Specialty Steel today to learn more about the wide range of product options. We’ll also be happy to provide a no-obligation quote.